When it starts raining inside your house, you know its probably not going to be a quick or easy fix. In our case, it took several months to find and fix the leak, but we ended up with a huge bonus – a living vertical garden privacy wall and a custom roof deck. Recently I had to use a vacation day to take my car to the dealer a recalled airbag. Quite possibly the least exciting use of a vacation day ever. But there was a Restore next to the dealership and I had been keeping my eye out for a new kitchen table for my mother-in-law. She wanted to replace her pink tile top table so that she could paint her kitchen a different color. So I decided to kill time and I found this not so lovely table for $35! The table had years of wear, many coats of polyurethane, and a ton of scratches, but I figured for $35, I would take a chance on it. It was my first project using a chemical stripper and stain and I learned a lot pretty quickly. 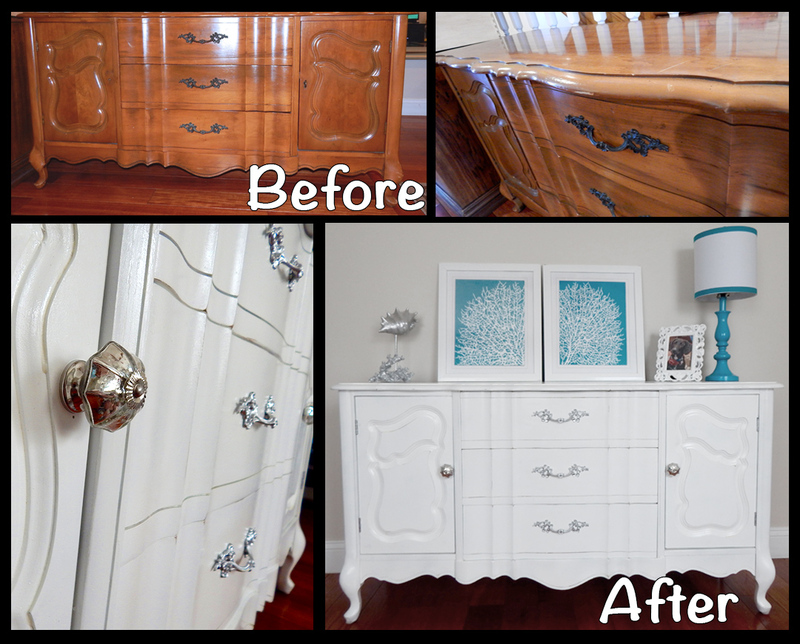 Read the full post below to see the steps I took and how it turned out. Unfortunately the after photos aren’t great quality – I was having some lighting issues with my camera. It looks much better in person. 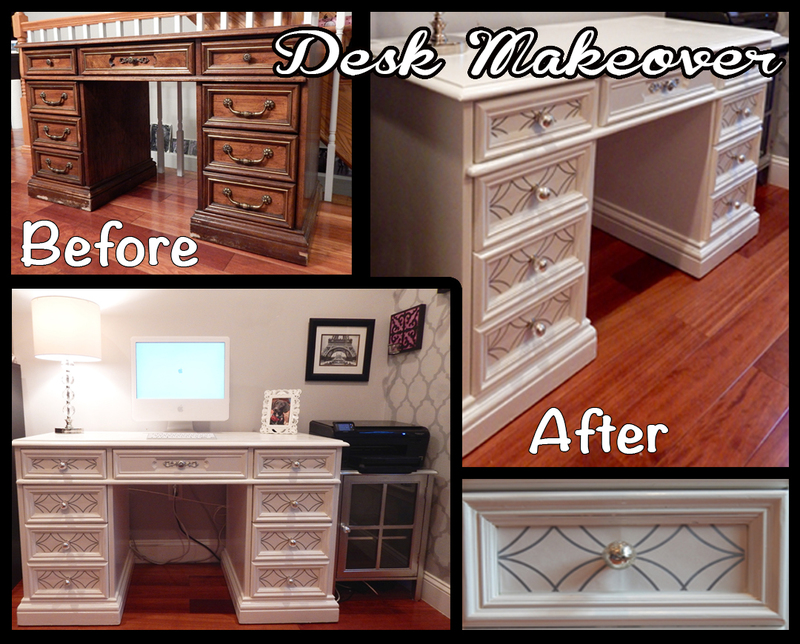 Desk Makeover with Wallpaper Inserts for Under $100! During my Black Friday online shopping spree this year, I splurged and bought myself a 27″ monitor for my home office, forgetting of course, that my desk had a hutch with an opening for a 20″ monitor. Oops! The monitor cost more than the desk, and I was thinking about making a change to this room anyway, so the oversize monitor gave me a good excuse to start desk shopping at Restore and on Craig’s list. I found a super heavy solid wood desk on Craigslist for $60 and talked the guy into letting me take it for $50. He told me that it had belonged to a doctor who had it in his office since at least the 1970’s, possibly longer. When I opened the drawers, there were notes on pharmaceutical post-its in what looked like an older woman’s script labeling each drawer location. So cute! The desk was fairly scratched and had several chips. It also had drawer pulls and I knew I wanted to use knobs instead, so I used some wood filler and wood glue to repair the broken parts. Then, after sanding, priming, painting, and polying, I wanted to give it a little bling, so I added some knobs from Homegoods, but still it wasn’t quite what I envisioned for the office. I had some silver circle wallpaper from Lowes laying around that I bought because I loved it, even though I knew I would never put it on my walls (too much work). I thought the metallic silver in the wallpaper it might look good with the drawer knobs. I made a template out of cardboard and cut a pattern out of the wallpaper. I gave the pieces a quick coat of spray on polycrylic for protection and attached them to the drawers with dots. I then drilled the holes for the knobs though the center of the wallpaper pattern. It looks great next to the silver cabinet I painted a few weeks ago that has become a printer stand and paper holder. I used the same knobs on both the desk and the cabinet to help tie them together visually. Four our guest room, I wanted to get a piece of furniture with cabinets in addition to drawers for some additional storage. I had been looking at buffets and sideboards on Craigslist for a while but could never find one in decent shape for a few hundred dollars or less. On a trip to the suburbs, I drove past a thrift shop and decided to pop in. This sideboard was buried under some old cash registers and picture frames, but was in good shape and was 20% off that day because it had a yellow sticker on it and apparently yellow was the color of the day so I got it for $80! It had one broken knob, was missing a knob, and had some scratches and nicks. After brining it home and giving it a good sanding with a power sander, I broke out my new favorite toy – a power sprayer! The sprayer took some getting used to – its not quite the same thing as spray paint, but it does make paint a lot more affordable. I hope everyone had a nice Memorial Day Weekend! I used the long weekend to work on a few projects inspired by all of the metallic furniture and accessories I’ve seen lately online and at Home Goods. I wanted to add a pop of silver to the office to play off the gray accent walls but I wasn’t sure where to start. Then I remembered I had a cabinet from the Christmas Tree Shop that I bought for the guest room before realizing it was the wrong color teal. It was only $19 so I never bothered returning it figuring I could find another use for it some day, so in the corner it sat waiting for its moment to shine. And now it certainly does shine! 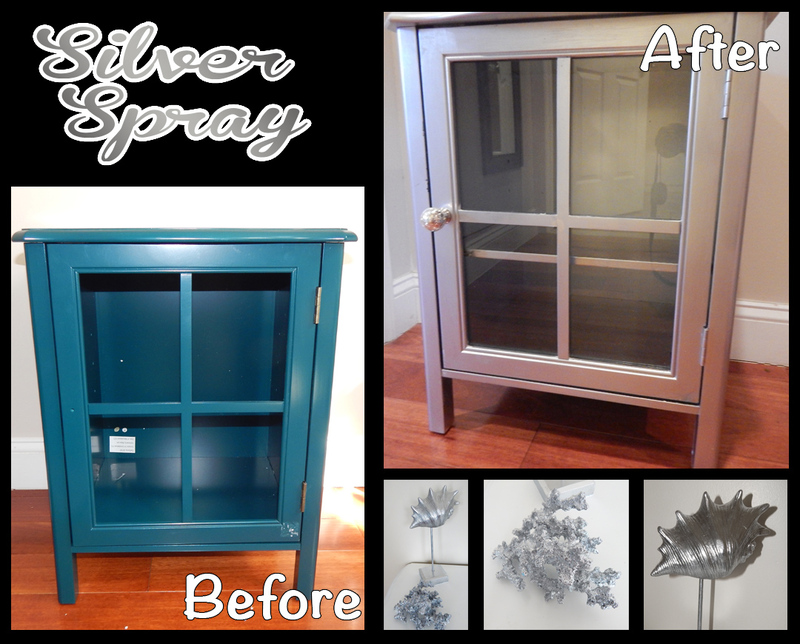 I bought a few cans of brilliant silver spray paint from Lowes and sprayed the little cabinet down. I added a coat of Polycrylic to seal it and should have used the spray on kind but I was out so I brushed it on instead – I should have just gone back to Lowes, I hate the streaks. I also added a knob from Home Goods that matches the desk knobs in that room. I’ve noticed that a lot of stores are carrying really pretty metallic coral and shells for $25+. I found a piece of white coral and a white shell on a stand at the Christmas Tree shop for $4.99 and $6.99 and coated them with some leftover paint from the cabinet. I was a little too excited and forgot to take before pictures. My wedding day was two years ago this week, so I thought I would post about a fun wedding idea that we had for our special day. One of the first projects we started was making small soy candles to be used as a combination place card and gift for our guests. I had made soy jar candles in the past but never in a large quantity at once – it was quite an undertaking! But not all that much work. It took a few hours after work each night for about a week or so to make the 60 candles after we had figured out the right recipe of wax to color to scent. I ordered a few scent samples from the wax company before I placed the order for the large bottles. This part was a lot of fun – I felt like a celebrity designing my own perfume. I wanted a light floral scent so I combined Lilac and Lilly of the Valley with a touch of Spring Rain. The scent of the candles filled the reception area at the wedding and it was a nice affect with the fresh flowers that were on display. Each batch of candles (we made about 6 at a time) was a slightly different shade than the next so it had a nice variation or color. We also added some pink and silvery gray ribbons around the base of the jars to go with our wedding colors. The labels matched our invitations. Spring is finally here! 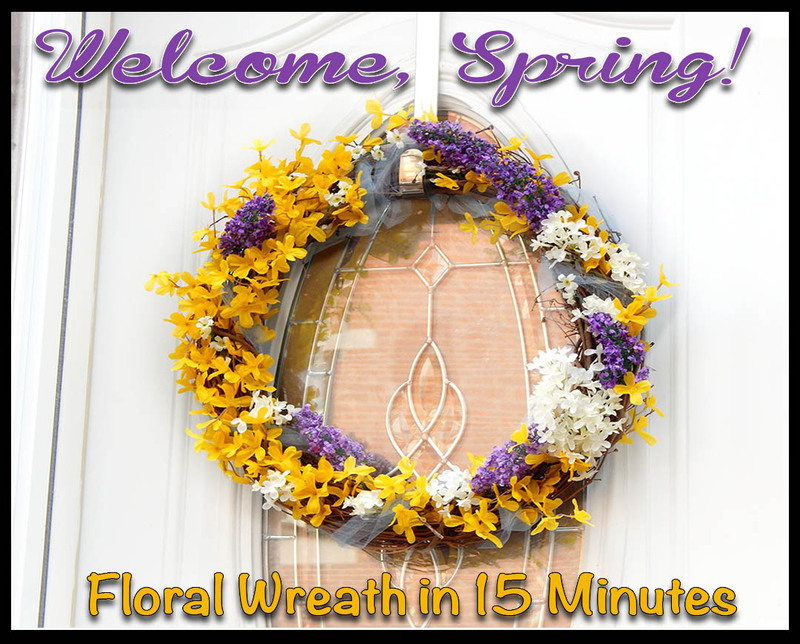 I am so excited for warm weather that I wanted to personally let Spring know it was welcome at my house by placing an invitational wreath for it on my front door. I looked at spring floral wreaths at some stores and was shocked about the pricing. The Christmas Tree Shop – a discount store – had a basic yellow floral wreath for $40. Forty Dollars! For some artificial flowers and twigs?? I knew I could make one a lot cheeper, and so I did! The supplies cost $20 at A.C. Moore with a coupon for 50% off one item that was used on one of the flowers. Making this wreath took about 15 minutes. I started by weaving tulle around the wreath so that I would have something to help keep the flowers in place. I didn’t want to use a glue gun for this project (mostly because I couldn’t find it) and between the tulle and the loosely intwined sticks of the wreath, I was able to weave the flower stems through enough open spaces to make them stick. I have had a few fall off but for the most part, it has held together pretty well. How are you welcoming spring to your house?